Certis OK! 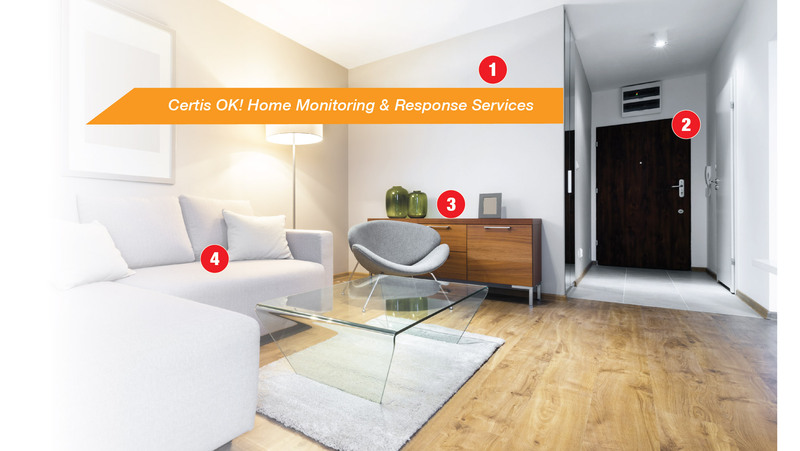 Home Monitoring and Response Service is a non-intrusive, affordable elderly home monitoring solution that ensures 24/7 effective and reliable support. The use of artificial intelligence (AI) and support services from Certis Healthcare provides timely attention to an elderly when needed. Certis OK! is a simple setup of sensors installed in the home where it monitors the trends of an elderly's activity and movements at home. The system is equipped with a distress button as well, which enables them to call for help at any given time. There are no cameras used in the system and therefore an elderly’s privacy is 100% protected. Certis OK! is easy to use and only requires a hassle free one-time installation. Comprising various sensors and an intelligent AI main unit, the system monitors movement and non-movement and detects activity anomalies based on back-end smart programming. Placed around the house to monitor activity. Placed at the entrance of the home to inform you that your relative has left/returned home. Main control unit between all devices and you. When pressed during emergencies by your elderly relative, an alert will be sent to you. The elderly's safety is Certis OK! 's top priority. Upon activation, a Certis Healthcare Responder will endeavor to reach the home of your relative at the earliest possible timing. The standard respond time is less than 90 minutes from activation. Privacy is important and we respect that. This non-intrusive elderly monitoring solution does not have any CCTV installed and the elderly can feel completely at ease, whilst knowing that help is readily available. Seniors may continue their daily activities and independent lifestyle at home knowing that they can call for assistance anytime they need to. You can have the peace of mind and reassurance of your relatives' well-being, especially so if they are aged 65 and above, living independently.